Mellany Msengezi Mariri | Vanity, sanity, reality: Who is King? Vanity, sanity, reality: Who is King? Today I found a quote which just simplified one of the concepts I talk about with entrepreneurs. I spend my day unlearning and re-learning business concepts. I was so excited getting better understanding of and learning new things. I would encourage that you never look down upon any opportunity to learn or refresh your memory as it helps you grow. So what is the statement that got me excited. It is just so simple: ‘Revenue is vanity, Profit is sanity, Cash is reality & Cash is king.’ WOW. The context is in terms of running our businesses so well that we get to have good cash flows. Remember the issue of financing that many businesses in our economy are battling with? As an entrepreneur if you do not manage cash well, you may end up folding and closing the business or you will sink in debt in the long run. 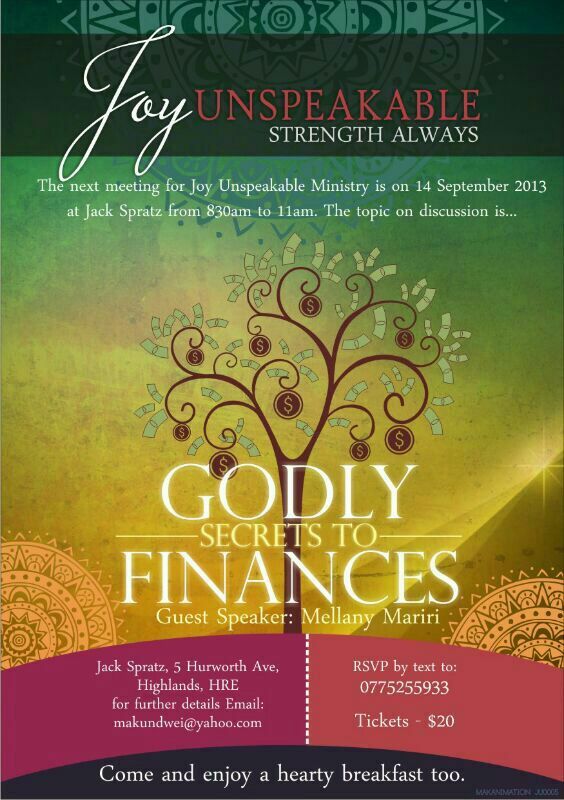 I will be talking about how to manage your money mind set on the 14 of September, 2013. I will touch on many aspects on how you can prevent months of no money and you end up truly suffering. You will need to invest $20.00 though you are going to get a wealth of information. I want you to be wealthy, healthy and happy. And in light of that, I am inviting you to come for a ladies breakfast meeting at Jack Spratz, 5 Hurworth Ave, Highlands- in Zimbabwe on the 14th of September, 2013 from 8.30am to 11am. The place has beautiful gardens and ambience. The Breakfast meeting is hosted by Joy Unspeakable Ministries. I will be downloading on Secrets to positively changing your cash flow. It is going to be practical, and you will have a networking opportunity with amazing people from all over the city, plus a lovely breakfast and coffee. For booking your seat, please email makundwei@yahoo.com or call on +263 775 255 933. Tickets are going for $20. Make your payment today via EcoCash to avoid disappointment. P/s: Invite friends and family whose success you care about!